When a vehicle is an accident and the car’s body is dented, the integrity of the sheet metal itself is altered. Collision repair technicians apply tools and techniques to bring it back to its original shape. If you’re looking to learn more about the process from an expert point of view, this article from the team at Automotive Training Center will walk you through how dents are removed from vehicles, to return cars to their former glory. Every dent and collision is different, which makes every dent repair unique. This post’s tips will focus mainly on large dent removal, typically at least a few inches long by a few inches wide. Smaller dents may be popped out or filled in using less intensive methods. To choose the tools you need for the job, it’s important to measure the dent’s length and depth. Body hammers and dollies are two types of tools you may use for dent removal. These tools will come in a range of sizes, shapes, and weights, so it’s essential to match the hammer and dolly used to the dent’s depth and curvature. Select the most modest-sized hammer that can do the job and the dolly whose shape most resembles the dented area’s shape. Hammering out the damage requires access to both sides of the dent: the underside and the outer surface. To get to the back of the dented metal, you need to remove door panels or fenders. You’ll hammer against the dolly, as it stabilizes the taps made inside the dented surface from the outside of the sheet metal. Position the hammer dolly on the outside of the dent and your body hammer on the inside. You’ll always want to begin by hammering from the center-most or deepest point of the dent. It’s important to do so with caution, as today’s sheet metal is thinner than it used to be. The last thing a collision repair technician will want to do is stretch things out further with a heavy blow using the hammer. Use the least amount of force required to achieve results that bring the metal closer to its original shape. Oftentimes, this will mean using short, gentle taps to bring things back in line. Like any do-it-yourself fix, practice always makes perfect. Even if it’s your first time undoing dent damage, by using our tips and a dose of diligence, you can hammer out a dent and be on your way to having your car look like new again. However, if the dent is too complicated to handle or you aren’t getting the results desired, you may take your vehicle to a collision repair technician. Automotive Training Center has helped many students become collision repair technicians. 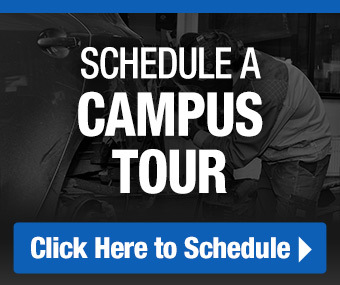 If you’re intrigued by a career in the automotive industry, get in touch with us to schedule a campus tour today! Thanks a lot for your advice to always start hammering from the center most point of the dent and do so carefully to avoid stretching the metal. The fact that today’s sheet metal is much thinner than it used to be would make this a delicate process indeed! I would think that to make sure nothing goes wrong with the process it would be a good idea to look for a professional repair service if the dents are large, or in a conspicuous location.